Keeping such a series fresh year-upon-year—FIFA 17 being the 24th main series entry by my (and Wikipedia’s) count—beyond player transfers and kit updates can’t be the easiest of tasks, however the forthcoming outing aims to dazzle in its finer details—such as “immaculately realised” stadium backrooms, facial animations that “more accurately show moving flesh over bone”, and “scowling authentically on the sidelines,” as per Ben's overview. So, the big question is: can your system handle it? 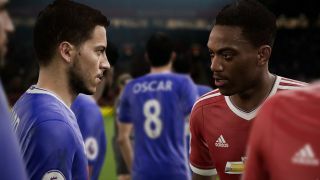 EA has now revealed FIFA 17’s minimum and recommended system requirements. So there you have it—plenty of time to get your dressing room in order ahead of FIFA 17’s September 27 North American launch, and September 29 everywhere else in the world.